This past Friday I dressed up for Halloween in what I think may have been the first time in over 10 years. 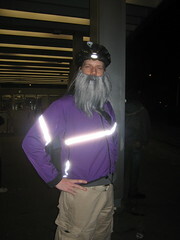 Not sure if you can tell from the photo, but I’m supposed to be a grey-bearded cyclist, the kind you usually see downtown. It turns out I really missed dressing up! This picture was taken much later in the night after spending the evening at a Karaoke bar. I’ve never done karaoke before and was nervous about it. I end up having a great time and even sang a song (“All The Small Things” by Blink 82 — it was easy). I think Scareoke will be a new Halloween tradition for years to come. More pictures from the night are here.